hen writing these letters each year, the same thoughts permeate my head. And instead of being concerned, I am thankful. The University of Wisconsin Athletic Department would like to thank our fans and the more than 14,000 donors who support our mission, allowing Badger student-athletes to achieve success in the classroom and on the playing field. On, Wisconsin! The Wisconsin men’s soccer team (left) captured its first Big Ten Championship in 23 years, while the Badger volleyball team made its fifth-straight NCAA Sweet 16 appearance. nsin softball went danche NCAA tournament n 2018, while freshman Wick (right) secured a medal finish at the championships. Orange Bowl MVP Alex Hornibrook celebrates a 34-24 win over Miami to claim Wisconsin’s fourth-consecutive bowl win. Women’s cross country placed 10th at the NCAA championship, the team’s best showing since 2014. The men’s cross country team saw UW teammates Ollie Hoare and Joe Hardy finish 1-2 at the Big Ten championship meet. Women’s cross country placed 10th at the NCAA championship, marking the 22nd time the program has finished among the top 15 at the national meet. The football team finished with an undefeated regular season for the first time since 1912, made its fifth appearance in the seven-year history of the Big Ten Championship Game, and claimed the Orange Bowl title. Women’s golf made an appearance in the NCAA regionals for the fifth time in the last six years. Women’s hockey claimed its third-straight WCHA regular season championship before advancing to the Frozen Four for the 11th time in the past 13 years. Men’s rowing placed 12th at the IRA national championships, its 13th-straight top-15 finish. For the 11th consecutive season, women’s rowing earned a bid to the NCAA championships. The Badgers have been invited in 14 of the last 15 years. Women’s lightweight rowing claimed a conference championship and secured a seventh-place finish at the IRA national championships. Men’s soccer claimed its first Big Ten championship in 23 seasons before advancing to the NCAA Sweet 16 for just the third time in program history. Women’s soccer made its second consecutive appearance in the NCAA tournament's second-round. Softball reached the NCAA tournament for the fourth time in the last six seasons. Beata Nelson shattered the Big Ten’s 100 backstroke record, helping women’s swimming and diving qualify for its 25th-consecutive NCAA championship, placing 17th. Behind 1500-meter national champion Ollie Hoare, men’s track & field finished 27th at NCAA outdoors. Women’s track & field finished 22nd at the NCAA outdoor championship as Georgia Ellenwood became the first Badger to win a national title in the heptathlon. Wrestling placed 17th at the NCAA championships, led by third-place finisher freshman Evan Wick. Volleyball advanced to its fifth-straight NCAA regional, marking the first time in program history that UW has competed in five straight regionals. Ollie Hoare enjoyed a great 2017-18 season for the Badgers as he won the NCAA title in the 1500 meters, earned three first-team All-America honors and won four Big Ten titles. Hoare started out his sophomore season by putting his name on the map when he won the 2017 Big Ten Cross Country meet. He followed that performance with a third-place finish at the NCAA Great Lakes Regional meet and earned an at-large bid to compete at the NCAA Championship meet. During the indoor track season, the sophomore swept the 3000 and 5000 meter events, earning two more Big Ten titles to his name. Hoare was named the Big Ten Track Athlete of the Championships for his efforts. Hoare earned two firstteam All-America finishes after competing at the NCAA Indoor Championships meet in the 3000 meters and as the anchor leg of the record-setting distance medley relay. Hoare made headlines when he ran 3:37.84 in his debut 1500-meter race of the season before winning the 1500 at Big Tens. Hoare made history at the 2018 NCAA Outdoor Championships, becoming the first Badger to capture an NCAA title in the 1500 meters since UW legend Don Gehrmann won a trio of NCAA outdoor titles from 1948-50. The Big Ten record holder in the heptathlon, Georgia Ellenwood capped off her final year with the Cardinal and White with an NCAA title in the heptathlon, becoming the first Badger to win a national championship in the event. The Langley, British Columbia, native was the lone Big Ten Conference female athlete to win a national title at the 2018 NCAA Outdoor Championships and captured UW’s second individual NCAA title in the last three years. An eight-time All-American, Ellenwood shined at the conference level, winning Big Ten titles in both the pentathlon and heptathlon. Her heptathlon score at the 2018 Big Ten Outdoor Championships of 6,173 points was not only a conference record, but ranks No. 10 in NCAA history and was the top score by a Canadian athlete this year. Ellenwood was named the Big Ten Field Athlete of the Year and the U.S. Track and Field and Cross Country Coaches Association Great Lakes Region Field Athlete of the Year for her efforts. Ellenwood also earned international recognition, becoming the 2018 Canadian National Champion and the Pan-American Combined Events Champion in the heptathlon. 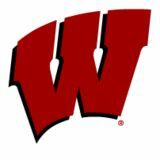 tudent-athletes at the University of Wisconsin set new records of excellence during 2017-18.
he Big Ten Conference Medal of Honor is presented annually at each institution to a male and female studentathlete in the graduating class for excellence in academics and athletics. Announced at this year’s annual student-athlete showcase of excellence, the Buckinghams, track and field standouts Georgia Ellenwood and Josh McDonald are the UW’s 2017-18 conference honorees. Now an eight-time All-American, Ellenwood leaves Wisconsin as one of the most decorated track and field athletes in program history. The Langley, British Columbia, Georgia Ellenwood native won the 2018 NCAA Outdoor title in the heptathlon thanks to a score of 6,146 points and personal bests in the 100-meter hurdles and high jump. She is the first female heptathlete in UW history to win a national championship and also placed third at the 2018 NCAA Indoor Track and Field Championships earlier this year, in addition to winning two Big Ten titles. She holds top-10 marks in 11 different events at UW, including school records in the pentathlon and heptathlon. Off the track, Ellenwood, a sociology major, is a four-time U.S. Track and Field and Cross Country Coaches’ Association All-Academic honoree and is a four-time Academic All-Big Ten selection. She was also named a Big Ten Conference Distinguished Scholar for her excellence in the classroom during the 2017-18 school year. McDonald, a two-time honorable mention All-American, has been a tremendous student-athlete during his career with the Badgers. The Wentzville, Missouri, native ranks No. 2 in school history in the indoor shot put and No. 3 in the discus. He qualified for the NCAA West Preliminary round for the fourthstraight year and entered the outdoor season strong after a podium Josh McDonald finish in the shot put at the 2018 Big Ten Indoor Track and Field Championships after throwing 62-7 3/4 and earning a new personal best that also ranked second alltime in UW history at the Big Ten meet. McDonald earned honorable mention All-America honors as a sophomore in the discus and as a junior in the outdoor shot put. The biology major has also shined in the classroom as he is a three-time Big Ten Distinguished Scholar, a four-time Academic All-Big Ten honoree and a four-time U.S. Track and Field and Cross Country Coaches’ Association All-Academic honoree. he Remington Scholarships are presented to the male and female student-athletes who completed their eligibility with the highest cumulative grade point averages and graduated this year. Named in honor of former UW professor Frank Remington, who was a faculty athletics representative to the NCAA, Big Ten and WCHA, recipients receive a $1,000 scholarship. Abby Jagdfeld completed an accomplished college career in and out of the pool in 2017-18. She earned honorable-mention All-America honors for a third time after swimming on the Badgersâ&#x20AC;&#x2122; 400-yard medley relay squad. She also participated on the 400 and 800 free relay teams at the NCAA championships. A two-time Academic AllBig Ten selection, Jagdfeld earned a 3.942 cumulative Abigail Jagdfeld GPA in microbiology and was also a UW Athletic Board Scholar. She was named a 2017-18 Big Ten Distinguished Scholar after completing the school year with a 4.0 GPA and is a three-time Scholar All-America selection by the College Swimming Coaches Association of America. Andrew Crone capped his collegiate wrestling career with his second career NCAA championships appearance competing at 157 pounds for the Badgers. He completed the season with a 26-12 overall record, going 7-2 in Big Ten duals. Finishing third at the Big Ten championships, he earned his NCAA qualification with a 6-2 decision victory. The Delafield, Wisconsin, native took third at 157 Andrew Crone pounds in the Big Ten championships, finishing 4-1 overall and racking up five victories against ranked opponents throughout the 2017-18 competitive season. As a junior, Crone was named Wisconsinâ&#x20AC;&#x2122;s Most Improved Wrestler and earned his first NCAA championship qualification at 149 pounds. A double major in finance & investment banking and risk management & insurance, Crone earned a 3.845 cumulative GPA as a Badger. He is a three-time recipient of the George Martin Scholarship Award, awarded to the undergraduate with the highest cumulative GPA. He is also a four-time Academic All-Big Ten honoree and a two-time UW Athletic Board Scholar. Ensure that student-athletes reach their maximum academic potential and make progress toward a degree. isconsin has some of the best fans in the nation and this is reflected annually as six sports rank among the nation’s leaders in attendance. Men’s Basketball Led the Big Ten in attendance and finished in the top seven nationally for the 18th straight season. Football Has ranked 18th or better nationally in attendance every year since 1993. Men’s Hockey Led the Big Ten and ranked second in the country in home attendance, drawing more than 198,000 fans in 2017-18. The team averaged more than 10,000 fans per game. Women’s Hockey Has led the nation in attendance eight of the last 12 seasons, including 2017-18. UW broke its own NCAA women’s hockey single-game attendance record in 2016-17 with a crowd of 15,359 attending the Fill the Bowl game at the Kohl Center. The past two seasons, Wisconsin has set Field House attendance records. In 2017, UW drew 60,120 fans over 10 matches for an average of 6,012 fans per match, which ranked third nationally. The Badgers sold a record 4,885 season tickets last year, including 2,350 reserved seats. UW sold out all but one match last season. BIG TEN NETWORK Big Ten Network is the first internationally distributed television network dedicated to covering one of America’s premier collegiate conferences. With over 1,000 sports events across all platforms in high definition, BTN gives Wisconsin and the other Big Ten school unparalleled coverage. Owning some of the most powerful media partnerships in all of college sports, the Big Ten Conference and the University of Wisconsin are well positioned in the national spotlight. The Badgers enjoy incredible exposure through marquee television and radio agreements, streaming video and numerous social media channels. All 23 of Wisconsin’s sports featured live video coverage in 2017-18. The Big Ten Conference’s media television agreements with CBS Sports, ABC/ESPN, Big Ten Network and Fox give the Badgers national coverage that rivals any school in collegiate athletics. Ollie Hoare talks with FloTrack moments after winning the 1500-meter run at the 2018 Big Ten Outdoor Championships. The Wisconsin Athletic Development Office, the fund raising arm for the University of Wisconsin Athletic Department, is committed to providing the resources needed for student-athletes to receive a lasting educational and athletic experience while contributing to the financial sustainability of the Athletic Department. The University of Wisconsin Athletic Department is completely self-sustaining and relies on the generous support of donors like you. We are committed to supporting each of our 800+ studentathletes to the highest degree and providing them with the needed resources to succeed. Gifts to Wisconsin Athletics are used to fund the total annual per student-athlete cost of excellence, including scholarship, travel, equipment, and other items which average $72,484 (out-of-state; $52,634 in-state) per student-athlete each year. The Badger womenâ&#x20AC;&#x2122;s hockey team advanced to the NCAA Frozen Four for the fifth-straight year. Badger student-athletes are able to accomplish all academic and athletic success through the generous support of you — the donor. By impacting the lives of those who proudly wear the Badger uniform, we take pride in knowing your investment will continue the future success and traditions of the University of Wisconsin. The University of Wisconsin Athletic Department would like to thank the more than 14,000 donors who support its mission allowing Wisconsin studentathletes to achieve success in the classroom, on the playing field, and in the community. On, Wisconsin! View the 2017 Donor Honor Roll here. ANNUAL FUND CAMPAIGN In 2017, a total of 14,248 donors contributed to help support over 800 Wisconsin studentathletes, totaling nearly $38 million to support. These patrons were able to participate in the new online seat and parking selection process for Football, Men’s Basketball and Men’s Hockey, called Badger Select. Badger Leadership Society The Badger Leadership Society recognizes donors for their lifetime giving of $250,000 and higher to Wisconsin Athletics. The society represents a dedicated program to promote philanthropic giving and honor those who have provided a transformational level of support through their generosity. Members of the BLS have made significant financial contributions through endowed scholarships, facility projects, and unrestricted giving over the course of their lifetime and are committed to a dedicated effort to advance the Wisconsin Athletics mission. Badger Leadership Society members were recognized by UW Athletic Director Barry Alvarez. Student-Athlete Thank-A-Thon Over 250 student-athletes participated in the UW Athletic Department's annual Student-Athlete Thank-a-Thon on April 10-12 at the Kohl Center and Camp Randall Stadium. 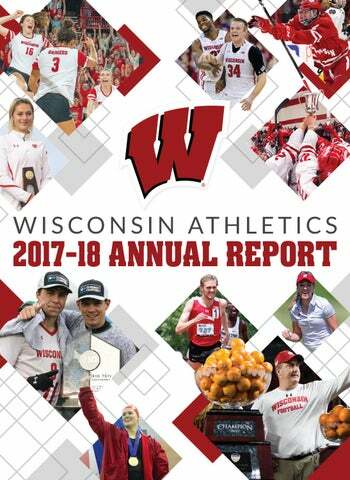 Studentathletes representing all 23 sports volunteered their time to write over 2,500 letters and make phone calls to personally thank donors who generously gave to Wisconsin Athletics in 2017. Student-athletes call donors during the 18th-Annual Thank-a-Thon. STEWARDSHIP & ENGAGEMENT Legends of Wisconsin Classic One of the most unique and popular annual events, it brings together two very notable groups; former Badgers greats and those individuals that generously contribute to Wisconsin Athletics. VIP Reception The VIP Reception with the Director of Athletics, hosted on October 13, drew over 150 donors in attendance. The event is a donor benefit for those who give at the Ambassador's Circle and Hall of Fame levels. The annual affair allows guests to meet and mingle with UW coaches and administrators. Football Training Camp Outing More than 200 generous donors to Wisconsin Athletics enjoyed the 2017 Football Training Camp Outing at Camp Randall Stadium. The participants had an exclusive opportunity to watch the football team practice and hear remarks from Coach Paul Chryst as the team prepared for the season opener. Luncheon Series UW Athletics welcomed veteran journalist and UW alum â&#x20AC;&#x2122;90, Andy Katz, as the keynote speaker for a UW Athletic Luncheon held on campus in October. Katz talked about his time working for the student newspaper and the advancement of the UW athletic programs and facilities since his time in Madison. Donors had the opportunity to golf with Badgers greats, including Andy North and men's basketball coach Greg Gard, at the 2017 Legends of Wisconsin Classic at University Ridge. STEWARDSHIP & ENGAGEMENT Exclusive Travelâ&#x20AC;&#x201D;Men's Basketball in Hall of Fame Classic More than 40 donors traveled to Kansas City with the men's basketball team for the Hall of Fame Classic. In addition to games, donors attended the National Collegiate Basketball Hall of Fame Induction Celebration as former UW Head Coach Bo Ryan was inducted. Donors were also treated to a breakfast with Coach Ryan the following day. Badger Desert Classic The Tom Wiesner Badger Desert Classic took place in Las Vegas in April. Activities included a Sunday night banquet, with live and silent auction, along with two days of golf. Football Locker Naming Campaign Since the addition of the Stephen M. Bennett Student-Athlete Performance Center in 2014, which included a new football locker room, former UW football student-athletes had an opportunity to make gifts to name individual lockers. With the completion of the project this past fall, donors were invited back to tour the locker room and see their names displayed. Kohl Center 20th Anniversary UW Athletics celebrated the 20th anniversary of the Kohl Center in January with the help of Sen. Herb Kohl, the lead benefactor in the project, in attendance. The Kohl Center has truly been a transformational facility for the University, the city of Madison, and the state of Wisconsin. Donors were invited back to the football locker room to see their names displayed on individual lockers. FOREVER BADGERS ENDOWMENTS Endowment Luncheon Donors to Wisconsin Athletics, Badger student-athletes and UW coaches and administrators attended the 18th Annual Forever Badgers Endowment Donor Appreciation Luncheon at Union South in October. This unique event provides the opportunity to recognize and thank the many individuals who have made generous contributions to establish and support over 240 endowed funds. Jack Link’s Protein Performance Center The Wisconsin Athletic Department places an emphasis on the welfare and nutrition of its over 800 studentathletes. In teaming up with a global leader in protein snacks, Jack Link’s, the ability to secure the resources needed to fuel the Badgers is in full force. The Jack Link’s Protein Performance Center, located in the Stephen M. Bennett Student-Athlete Performance Center, officially opened in February. Nicholas Recreation Center Ground breaking Facility donors to the new rec center, along with many campus friends, gathered in May for a ground breaking and celebration as construction is well underway for “The Nick,” which is scheduled to open in the fall of 2019. In addition to accommodating the recreation and wellness needs of UW’s student body, the facility will also provide a state of the art pool and diving well for UW swimming and diving teams. Donors were recognized on the field of Camp Randall Stadium during a game. isconsin Athletics’ community relations platform, “Badgers Give Back,” is dedicated to being a difference-maker in the community by providing meaningful engagement opportunities with UW studentathletes, staff and alumni. Through mutually beneficial community partnerships routed in developing long-lasting relationships, Badgers Give Back strives to create a culture of giving through socially responsible programs and events. The athletics department embraces the importance of “working for a cause, not applause,” by encouraging, engaging and serving our neighbors through initiatives centered around youth development, health and wellness and community impact. Encouraging physical and mental well-being for people of all ages The tradition of weekly hospital visits, called “Badger Fridays,” blossomed into a powerful partnership with American Family Children’s Hospital that allowed all UW teams to visit patients room-to-room, touching the lives of 1,000 families. Twelve Wisconsin teams formed unbreakable bonds with a total of 21 patients from the hospital through unforgettable “Wish Upon A Badger” experiences, leaving memories for a lifetime. rough the Foundation for Madison Public Schools, Wisconsin Athletics adopted Randall Elementary to help close the achievement gap for 370 kids ough a multifaceted approach that best served the udents. One aspect of the partnership was a pen al program that saw 636 letters written between Randall students and UW student-athletes. Creating a culture of giving by working together in service and leading by example Wisconsin Athletics partnered with Goodman Community Center and Lussier Community Education Center to aid in their commitment to strengthen the lives of Dane County residents. These efforts included collecting school supplies to allow 250 students to head back to school prepared for the year and helping to get 1,500 holiday gifts in the hands of underprivileged youth in the community. de student-athletes with the opportunity to enrich lives by encouraging, engaging and serving others. not only the values of the athletic department, but those of the campus as well. These partnerships often expand beyond athletics to positively impact students across campus. The merchandising partners of UW Athletics are Gold Country, Inc., and Fanatics. Gold Country, Inc., continues to operate Bucky’s Locker Room retail stores at Camp Randall Stadium and the Kohl Center, including all game-day merchandising at all UW Athletic facilities. Fanatics is the department’s exclusive website merchandise sales partner. Under Armour and the UW Athletic Department just concluded the second year of a comprehensive sponsorship agreement in which Under Armour serves as the department’s exclusive provider of athletic apparel for all 23 Badgers teams. adger athletics has a large impact on the Madison area, not only in terms of athletic events, but also in the number of other events athletic facilities host. In addition to the 180 athletic events, UW Athletics also hosted high school and other competitions, concerts and dinners, banquets and miscellaneous events. The UW has also continued to host facility tours of Camp Randall Stadium, the Kohl Center and LaBahn Arena. As part of the Feb. 15 men’s basketball game, Wisconsin Athletics retired No. 44 for Frank Kaminsky. New in 2017-18 was the introduction of Sunday Kids’ Days presented by Kohl’s. Each regular season Sunday home event featured something specially designed for the youngest Badger fans with several new opportunities to cheer on the Badgers. Several events featured a premium item giveaway such as Bucky Badger piggy banks, Badger lunch bags and Bucky Badger bobblehead toothbrush holders. Some offered unique experiences like the opportunity for kids to make a lay up on the Kohl Center court following a men’s basketball game. Still other events featured special ticket offers only available to kids age 12 and under. HALL OF FAME Eleven Badgers were inducted into the UW Athletic/National W Club Hall of Fame in 2017. Their induction brings the total number of members in the hall to 231. CRAZYLEGS CLASSIC The 2018 Crazylegs Classic celebrated its 37th anniversary in April with approximately 12,000 runners and walkers participating on a beautiful spring day! This annual event is organized and administered by the W Club and the UW Athletic Department, along with a loyal set of long-time race volunteers with proceeds goi into the general athletic scholarsh fund. The race is named for Elroy “Cra zylegs” Hirsch, the former UW foo ball star and athletic director who was the official starter for every race from 1982 until his death in 2004. Since that first race in 1982 more than 354,000 runners and walkers have taken part. Alando Tucker, UW men’s baske ball’s career leading scorer, served as this year’s Grand Marshal. Joining in as the celebrity walk-starter were 2018 Olympic curlers Becca Hamilton and Nina Roth. Exciting changes were incorporated in the 2018 Crazylegs Classi event: The official Crazylegs T-shir was an Under Armour tech tee; the start line for both the runners and walkers was on State Street; and post-race festivities took plac on the east side of Camp Randall Stadium. Live entertainment was provided by DJ Shawna (Shawna Nicols – UW women’s basketball alum ’03) – Midwest’s Premier Open Format DJ. 2007 NCAA National Championship Team to celebrate their 10-year anniversary. During the UW women’s hockey game vs. Bemidji State on Oct. 20, 2017 at the LaBahn Arena, seven team members and assistant coach in attendance were recognized. festive gathering of over 100 alums provided a chance to socialize, enjoy fellowship, and have a great view of the Homecoming Parade. The pre-game Letterwinner Tunnel took place prior to the UW vs. Maryland football game on Saturday, October 21st. A time-honored tradition of the Letterwinners is to come back on W Club Day to take part in the Letterwinner Tunnel. The former student-athletes proudly wear their varsity letter jackets during a home football game and form a “tunnel” for the Badger football players to run through. Approximately 100 Letterwinners participated in this. he 2017-18 fiscal year continued Wisconsin’s long history of finishing the year with a positive cash balance. This consistency is representative of our on-going commitment to carefully managing our resources. We continue to closely monitor our expenses to assure that our projected revenue streams are adequate to cover our operational needs. The success of Badger Athletics is enjoyed not only in the Division of Intercollegiate Athletics but also by students across the campus. Licensing fees from the purchase of items with UW logos are shared with the campus and last year provided over $1.9 million in financial aid for undergraduates with demonstrated financial need. Additionally, UW Athletics contributed over $5.7 million to campus from revenues generated through the Big Ten television revenues. Recent changes in the college athletics landscape promises to make 2018-19 a challenging year for UW Athletics. The breakout of the “Power Five” conferences from the rest of the NCAA will continue to bring significant revisions to the existing paradigm. Uncertainties surrounding recent litigation call for further study and clarification before final determination of economic impacts. Rule changes regarding the cost of attendance, student-athlete meals, and other student-athlete initiatives have brought significant cost factors to the forefront. We will continue to be good stewards of our financial resources while providing a high quality academic and athletic experience for our student-athletes. t what was actually received. Achieve a balanced annual operating budget, secure resources to support the facilities needed by our student-athletes and maintain the departmentâ&#x20AC;&#x2122;s cumulative financial reserves. Compliance The three main functions of the compliance office are to educate, monitor and self-report violations. Above: The compliance office regularly provides education to suiteholders and their guests. This message appears in suites at Camp Randall and the Kohl Center during UW contests and WIAA events. Monitoring Initiatives The compliance office monitors athletic department activities by reviewing documentation submitted by coaches and staff on a variety of activities including practice times, travel itineraries, communication with prospective student-athletes, donation requests and occasional meals. The compliance office recently transitioned many of its monitoring practices to JumpForward, an online solution utilized by many athletic departments nationwide. Monitoring helps the compliance office identify and reduce areas where the institution and athletic program are most at risk for violating NCAA, Big Ten Conference, WCHA, and institutional rules. If a violation occurs, the compliance office self reports the violation. The self-reporting process requires the compliance office to determine how the violation occurred, how the violation could have been prevented and how to prevent the violation from recurring. Among other actions resulting from a violation, the compliance office may modify or develop a form that will promote future compliance. Throughout the year, the compliance office reviews autographed memorabilia requests to ensure all donations are in accordance with NCAA rules. Furthermore, the compliance office also authorizes all requests for student-athlete appearances. Spread awareness of NCAA rules and regulations that govern athletics and ensure strict adherence to those rules and regulations. 79 events, courses, workshops, or 1,946 one-on-one meetings coordinated by the OSAD. athlete body) took advantage of meeting one-on-one with OSAD staff to discuss and work towards personal and professional goals. held a variety of internships and jobs, totaling 239 experiences in the professional setting. These experiences helped them gain specific experience related to their future career goals. Additionally, OSAD supports a program called the BADGER INTERN PROGRAM. This is an opportunity for all eligibility and medically exhausted student-athletes to gain valuable insight and experience into their specific career fields of interest. OSAD coordinators help these individuals find meaningful internships in the surrounding community as they continue pursuing their remaining coursework on campus. Thirty students were placed in 2017-18. GRADUATED STUDENT-ATHLETES The OSAD assists all graduating student-athletes with finding meaningful career placement, whether thatâ&#x20AC;&#x2122;s through a full-time job or continued education. The cycle in which the OSAD tracks meaningful placement is within six months of graduation. The 2017-18 career placement data will always be published on Dec. 1 of each year. The details to the right include our career placement data from 2016-17 for reference. • 3 employers (American Family Insurance, Aurora Healthcare, First Business Bank) hosted OSAD staff for site visits to learn details about their company. fair is a success and enhances my connections. GAME DAY SUITE VISITS Student-athletes visited suites of season ticket holders and donors at home football games to practice their elevator pitches, make connections, and build networks for potential career opportunities. CP 115: LIFE SKILLS ACADEMY A one-credit transition course for all first year student-athletes that consisted of peer-to-peer education on relevant life skills topics related to self-awareness and exploration, health and wellness, and promoting positive change. 30 guest speakers across campus and athletics Highlights include: Completing "Behind the Uniform," which paired two first years together, and the Individual Elevation Map, which focused on career development and outlining Involvement goals. CP 300: PEER LEADERSHIP A three-credit course where upperclassmen peer leaders facilitated discussions and activities for the first year studentathletes who were enrolled in the CP 115: Life Skills Academy course. Through self-awareness assessments and class activities, peer leaders developed several skill sets including small group facilitation, conflict management, and leadership. ELPA 502: LEADERSHIP DEVELOPMENT FOR THE YOUNG PROFESSIONAL A three-credit course that examined a range of leadership development models and offered hands-on activities and experiences designed to help develop the necessary leadership skills required to be successful in any organization (i.e. academic, athletic, business, professional). 22 students enrolled in spring 2018 Highlights include: each student came up with a two-word purpose statement in addition to values, critical goals, and action plans to utilize course content throughout different leadership roles in their lives. CP 110: CAREER STRATEGIES A one-credit course that used individual and group development activities to explore personal career development planning. Students learned about themselves as well as the world of work, and how the two intersect to conduct a successful job search and find meaningful employment. 23 students enrolled in fall 2017 Highlights include: completing a personal assessment to recognize relation to career interests, conducting informational interviews with employers, and creating a career portfolio with specific goals outlined for future professional development. CP 300: TRANSITION FORWARD A one-credit course designed to address topics related to the transition out of being a college student-athlete, including the psychosocial, physical, and professional transitions. 14 students enrolled in spring 2018 Highlights include: completing the Clifton Strengths Finder to establish personal strengths related to all aspects of life, creating vision boards with future goals, hearing from a “life after sports” panel of former student-athletes, and learning about expectations for future healthcare, nutrition, finances and wellness. STUDENT-ATHLETE ADVISORY COMMITTEE (SAAC) A student-athlete organization that met monthly to provide a direct link to UW Athletic Administration, the Big Ten Conference and the NCAA. SAAC is a leadership organization that provided an opportunity for student-athletes to enhance their experience through engagement in service and social events, and creating spaces for discussion to help empower student-athletes as it relates to student-athlete welfare. The SAAC is guided through the core principles of equality, transparency, integrity, service, and respect for diversity with attention to gender, race, ethnicity, and sport. Seven student-athletes from six sports made up the Executive Board, selected through a committee voting process Events hosted and initiatives facilitated by SAAC included: the annual Mr. & Ms. Bucky Competition, the Student-Athlete Career Night Fashion Show, two One Team Yoga Nights to focus on mental health and relaxation, De-Stress December themed events with service dogs and hot chocolate, a Staff Appreciation initiative as well as an opportunity to engage future leaders through the new SAACessor program. LEADERSHIP LESSONS The OSAD hosted one Leadership Lessons session with a highly successful alum (Bob Paulsen) to share details about his experience working in a variety of companies and gave advice about chasing dreams in the professional realm. LEADERSHIP CERTIFICATE OSAD staff worked closely with CfLI staff to educated student-athletes on the leadership certificate and applicable student-athlete components, reinforcing the commitment to developing student leadership capacity through intentional reflection and engagement in learning, both inside and outside the classroom for the purpose of meaningful change. STUDY ABROAD A partnership developed with the International Academic Programs (IAP - Study Abroad) Office to make study abroad opportunities accessible for student-athletes, as well as opportunities funded through the athletic department. Additionally, one trip was organized by the athletic department this summer. finances, apartment living, leadership, and team building. THE BUCKINGHAMS THE BUCKINGHAMS: STUDENT-ATHLETE SHOWCASE OF EXCELLENCE A formal event where student-athletes’ academic successes and their student-athlete development involvement were highlighted through the presentation of awards and honors. Student-athletes’ unique talents were showcased through a variety of performances and students get to walk the red carpet. This year was extra special, as we celebrated the 10th year of the show! talented student-athletes showcased seven different performances  10 of singing, playing instruments, reading poetry, and dancing! ONE TEAM CELEBRATION A department-wide welcome back event for all studentathletes, coaches, and athletics staff members to come together and promote community, and kick off the year with a “thank you” to the dedication of every one who contributes to the consistent high level of performance our student-athletes embody on and off the field, court, rink, water, course, or mat. TITLE IX With the collaboration between athletics, violence prevention specialists and Title IX coordinators across campus, we coordinated educational programming for all student-athletes, coaches, and athletics administrators to meet the following learning objectives related to prevention sexual violence and harassment outlined by the NCAA. This year, the training focused heavily on one of the leading violence prevention strategies in the country, Green Dot – which outlines specific risk factors and strengthens protective strategies with developmentally appropriate, skills-based and research informed approaches. plus participants from the 12 women's sports at Wisconsin. The get together included an open forum moderated by Sarah Spain and a panel of speakers featuring two ESPN executives, Carol Stiff and Katina Arnold, and a diverse group of accomplished Badger alum women who knew precisely how it feels to be a student-athlete at Wisconsin. nnell Professional Development Institute–Student-Athlete Development Track. Davies also completed an NCAA Leadership Effective Facilitation Workshop. ▪ Assistant Athletic Director for Career and Leadership Bridget Woodruff earned her certification in Business Process Improvement and graduated from the Transition to Executive Management through the UW Center for Professional & Executive Development. ▪ Athletic Trainer Alyson Kelsey provided an Evidence Based Practice presentation at the Great Lakes Athletic Trainers’ Association Annual Meeting. She also serves as the Wisconsin Athletic Trainers’ Association Website Committee Coordinator, serves on the Great Lakes Athletic Trainers’ Association Young Professionals Committee, and the Wisconsin Athletic Trainers’ Association Young Professionals Committee. Kelsey was also presented with the 2018 Outstanding Clinical Preceptor Award by the UW Athletic Training Education Program. ▪ Athletic Trainer Brian Lund presented at the Big Sky Sports Medicine Conference. ▪ Athletic Trainer Kyle Gibson presented at the Tiny Earth Symposium and at the National Athletic Trainers’ Association Annual Meeting. tee and was the N4A Mentor Program Coordinator. ▪ Academic Advisor Kelly Higgins was a member of the N4A Strategic Planning Ad-Hoc Group. She was also certified in the N4A Professional Development Institute–Leader/Manager Track. ▪ Academic Advisor Chris Butler was a member of the UW Dean of Student’s Advisory Committee and the UW Letters & Science Advisor’s Consortium. ▪ Academic Advisor Chrissy Steffen was a member of the N4A Ethnic Concerns Committee. ▪ Academic Advisor Jill Hadfield served on the UW Council on Academic Advising and the UW Orientation and Advising Team. ▪ Academic Advisors Kelly Higgins, Tracey Maloney, Chrissy Steffen, and Danielle Straw presented the Badgers to Badgers for the Campus Advising Community. ▪ Inclusion and Engagement Coordinator Sheridan Blandford was named a 2018 Rising Star by the Women Leaders in College Sports and will receive a scholarship to attend the organization's national convention in October in Atlanta. ▪ Associate Athletic Director for Business Operations Mario Morris received the McLendon Minority Scholarship to attend the 2018 LEAD1 Institute in July. With a win over No. 6 Purdue (Feb. 15), head coach Greg Gard recorded his sixth top-10 win in just three seasons at the UW helm. Happ is quickly climbing the UW record book, finishing the season ranked in the top 20 in career points (8th; 1,541), rebounds (2nd; 875), assists (15th; 270), blocks (6th, 110) and steals (3rd; 179). Freshman Brad Davison earned Big Ten All-Freshman Team honors after ranking second on the Badgers, and second among Big Ten freshmen, scoring 12.1 ppg. He is just the fourth Badger in the last 20 years to average double figures as a freshman. In its second year of existence, Greg and Michelle Gard’s Garding Against Cancer initiative has raised more than $2 million in the fight against cancer across the state of Wisconsin. Ethan Happ earned first-team All-Big Ten honors. Wisconsin has had 15 first-team All-Big Ten selections over the last 17 seasons, the most of any school over that span. Cayla McMorris and Marsha Howard earned honorable mention AllBig Ten honors. McMorris was a consensus honorable mention pick, earning her second-straight award by the media while Howard was recognized for the first time by league media. Senior Cayla McMorris became the 25th UW player to score 1,000 career points when she hit a driving lay-up early in the third quarter against OSU on Feb. 3. The 6-0 guard finished her career with 1,074 points, which ranks 22nd on the Badger record list. Wisconsin had two of the most improved scorers in the Big Ten in 2017-18. Junior Marsha Howard ranked 11th, improving her scoring by 4.9 points per game, while sophomore Abby Laszewski tied for 12th in the Big Ten, upping her scoring by 4.5 points per game. Freshman Niya Beverley picked up her 100th assist of the season at Michigan State on Feb. 21, one of only four Big Ten players with 100-plus assists (106) and fewer than 50 turnovers (49) in the regular season. The Badgers took care of the ball in 2017-18, averaging 15.3 turnovers per game on the season, which ranks fourth on the UW season record list. Wisconsin reduced its turnovers by nearly four per game from last season. The Badgers had 14 double-doubles this season, doubling last year’s total. Junior Marsha Howard and senior Cayla McMorris led the team with five double-doubles each. Sophomore Suzanne Gilreath made 70 3-pointers this season, which ranks sixth on the UW single-season record list. The 5-4 guard also ranks fifth with 198 3-point attempts. Oliver Hoare and Joe Hardy went 1-2 at the Big Ten Championship meet to lead the Badgers to a third place overall finish. Hoare earned his first Big Ten cross country title while Hardy recorded his highest-ever finish at the championship meet. The Badgers earned a pair of third-place finishes at postseason meets this season. They finished third overall at the Big Ten Championship with 88 points and earned another third-place finish at the NCAA Great Lakes Regional with 51 points. Led by a top-25 finish from senior captain Joe Hardy, the Badgers finished 25th overall at the Nuttycombe Wisconsin Invitational. Hardy finished 25th overall in the premier home competition with an 8K time of 24 minutes, 5.7 seconds. The Badgers are set to host the 2018 NCAA Cross Country Championships at the Zimmer Championship Cross Country Course. This will mark the first time since 1978 that UW has hosted the national cross country meet. Oliver Hoare led the Badgers to an eighth-place overall finish at the Greater Louisville Classic in September. The sophomore finished the 8K race with a personal-best time of 23 minutes, 40.5 seconds. Hoare’s performance earned him Big Ten Cross Country Athlete of the Week honors. Three Badgers finished among the top 15 at the NCAA Great Lakes Regional to help UW finish third. Sarah Disanza, Amy Davis and Shaelyn Sorensen earned all-region honors for their performances. Five UW runners finished within the top-seven at the Mayflower Day Open. Led by Alicia Monson and Amy Davis’ 1-2 finish, Wisconsin started its season on a high note, winning the triple-dual meet. The Wisconsin women’s cross country team placed ninth at the Nuttycombe Wisconsin Invitational, which tied the best finish in program history at the prestigious home meet. Sophomore Alicia Monson led the way for the Badgers, finishing 19th overall in the 6K race. The Badgers finished 10th at the NCAA championship, marking the 22nd time in program history that the team has finished in the top-15 at the national meet. Senior Sarah Disanza was the top finisher, coming in 39th. The Badgers won a school-record 13 games on the season and set another program record with their 9-0 record in Big Ten play. UW repeated as Big Ten West Division champion, claiming its third division title in four seasons. Wisconsin saw a school-record seven players named All-Americans, a list headlined by first-team All-America picks Beau Benzschawel, David Edwards and T.J. Edwards. RB Jonathan Taylor broke Adrian Peterson’s NCAA freshman rushing record by running for 1,977 yards in his rookie season. Taylor was a finalist for the Doak Walker Award, a secondteam All-American and a first-team All-Big Ten selection. Under first-year coordinator Jim Leonhard, UW’s defense ranked No. 2 nationally, allowing 262.1 yards per game. UW was third in scoring defense (13.9 ppg), third in rushing defense (98.4 ypg) and No. 1 in pass efficiency defense (96.4). Defeating Miami in the Orange Bowl, UW won its fourth consecutive bowl game. The victory also gave the Badgers back-to-back wins in New Year’s Six bowls after defeating Western Michigan in the Cotton Bowl following the 2016 season. The Badgers’ season average of 294.9 strokes per round was fourth-best in school history and second-best in head coach Michael Burcin’s seven years at the helm. Junior Jordan Hahn recorded five top-15 finishes and was the Badgers’ first or second finisher in nine of 11 tournaments. His scoring average of 73.35 was seventh-best in program history. Freshman Griffin Barela tied for the top spot at the D.A. Weibring Intercollegiate in April, becoming the first Badger medalist since 2009. Barela also earned Big Ten Golfer of the Week honors after finishing tied for eighth in his collegiate debut at the Badger Invitational. After upsetting ranked opponents Illinois and Northwestern, Wisconsin went on to place third at the 2018 Big Ten Match Play Challenge, finishing with a perfect 4-0 record. Senior Eddie Wajda finished his four years at UW with a career scoring average of 74.78, good for eighth on the Badgers’ all-time list. The Badgers were selected to play in the NCAA Madison Regional, marking the sixth time in the last eight years UW has advanced to NCAA postseason play. Senior Gabby Curtis became just the second Badger to qualify as an individual for the NCAA championships, earning a share of fourth place at the NCAA Madison Regional and tying the 54-hole school record with a 209 (-7). The same five golfers made up the Badgers’ lineup in all 11 events this season: seniors Curtis, Lexi Harkins, Aya Johnson and Becky Klongland and junior Jessica Reinecke. Curtis set the school record by playing 139 rounds in her four-year Badger career, appearing in every tournament for UW. Her career scoring average of 74.49 is second-best in school history. UW’s season average of 292.3 strokes per round was the best in school history. That was nearly four strokes better than the previous school record, set in 2016-17. Senior forward Ryan Wagner posted career highs with 15 goals and 33 points to pace the Badgers in scoring. He was voted the team’s Spike Carlson/Chris Chelios MVP. Wisconsin head coach Tony Granato became the second Badgers coach to lead a U.S. Olympic Team when he directed Team USA to fifth place at the 2018 Olympic Winter Games in PyeongChang, South Korea. Bob Johnson was the first in 1976. Wisconsin ended No. 1 Notre Dame’s 15-game winning streak with a 5-0 drubbing of the Fighting Irish on Jan. 21 at Chicago’s United Center. Eight Wisconsin freshman defensemen have recorded at least 25 points in a season all-time, including Wyatt Kalynuk, who posted 22 assists and 25 points. He’s the first since Sean Hill who did it in the 1988–89 season. UW’s rookies averaged 2.65 points per game to rank sixth in the country in freshmen scoring. They were UW’s highestscoring class with 98 points. UW scored three goals on penalty shots to set the program mark for a season. Among those were first career goals for freshman forwards Tarek Baker and Sean Dhooghe, the first Badgers to score their first collegiate goals on penalty shots. UW ended the 2017-18 season with 31 wins, marking the seventh time in school history the Badgers have won more than 30 games in a season. Wisconsin advanced to the Frozen Four for the fifthstraight year, the longest active streak in women’s college hockey. Wisconsin won the WCHA regular-season title for a thirdstraight year and for the seventh time in school history. UW led the NCAA in attendance for the third-straight year, averaging 2,265 fans per home game at LaBahn Arena. Wisconsin’s varsity eight finished 12th at the 2018 Intercollegiate Rowing Association National Championships, two places higher than their seed coming into the regatta. The Badgers’ fifth varsity eight won its second-straight Eastern Sprints title this spring, marking the first time a UW varsity boat has won back-to-back crowns since the third varsity eight claimed two consecutive EARC titles in 2009 and 2010. Wisconsin extended its winning streak to 13 years in the race for the Cochrane Cup. Traditionally a race between Dartmouth, MIT and Wisconsin, it has just been UW and MIT since 2013. UW fell to Boston University for the sixth consecutive time in the race for the Jablonic Cup in that same race. The Badgers landed 22 rowers on the Academic All-Big Ten Team. For the ninth consecutive season, Wisconsin claimed a top-three finish at the Big Ten championships, taking third as a team in Indianapolis. A total of 25 women’s openweight rowers were named Academic All-Big Ten, the second-most of any women’s sport at UW and fourth among all UW teams during the 2017-18 season. The Badgers were awarded the 2019 Big Ten Rowing Championships that they will play host to at Devil’s Lake State Park on May 19. It will mark the third time UW hosts the championship, along with the 2000 and 2007 events on Lake Wingra. For the first time in 2 seasons, the Badgers had a Big Ten Boat of the Week as the second varsity eight earned the honor on May 1 for their wins over Princeton and Syracuse. For the 11th consecutive season, Wisconsin earned a bid to the NCAA championships. The Badgers have been invited in 14 of the last 15 years, and 15 times all-time. Thirteen of 15 NCAA bids have come under head coach Bebe Bryans. Senior Kate Ruffalo was among the first Americans chosen to represent the United States at the 2018 World University Rowing Championship in Shanghai, China. After weather forced cancelation of some finals of the 2018 Intercollegiate Rowing Association (IRA) National Championships, two Badger boats took part in the “Rogue” IRAs, with the four taking second and the double sculls finishing third. Sophomore Grace Joyce was chosen to row in Poznan, Poland, at the 2018 World Under 23 Rowing Championships in the lightweight quadruple sculls, UW's first such selection since 2016. Wisconsin advanced to the Sweet 16 for just the third time in school history and for the first time since 1995. An impressive season came to an end for Wisconsin against powerhouse No. 5 seed Akron in overtime. UW was the only team to score two goals on Akron the entire season. UW’s magical run in the 2017 Big Ten Men's Soccer Championship had a storybook ending against No. 2-seeded Indiana as the Badgers claimed their first-ever outright Big Ten tournament title on penalty kicks. Chris Mueller led the nation in both assists (20) and assists-per-game (.95). The Schaumburg, Illinois native led the Big Ten in points (38), while also leading the league in shots (72) and shots on goal (30). Mueller assembled quite the list of honors over his four-year career. He’s a two-time All-American, two-time All-Region honoree and a two-time All-Big Ten First Team member. For the first time in school history, the Wisconsin men’s soccer team had two top-10 selections and four overall draftees in the 2018 Major League Soccer SuperDraft. Senior Chris Mueller was selected at No. 6 by Orlando City SC and senior Mark Segbers was picked at No. 9 by the New England Revolution. Senior forward Tom Barlow was the No. 39 pick in the second round by the New York Red Bulls. Senior Mike Catalano was selected in the third round by the Philadelphia Union. The Badgers were the only team to have two top-10 selections. Wisconsin had two wins over top-15 programs, including the highest-ever ranked win in school history over No. 3 Virginia and an upset of No. 11 Penn State. Wisconsin had a record five players earn Big Ten weekly honors this season. UW’s thrilling upset win over No. 11 Penn State was the gift that just kept giving, as Caitlyn Clem was named the Big Ten CoDefensive Player of the Week and Cameron Murtha was named the Co-Freshman of the Week for their stellar game performances. After an impressive week that included an upset of No. 3 Virginia, Wisconsin clinched a spot in every category of the Big Ten conference’s weekly honors on Tuesday, as Caitlyn Clem, Dani Rhodes and Lauren Rice each earned accolades. Sophomore Dani Rhodes led the team in goals (11), assists (5), points (27), shots (73) and shots on goal (34). There was a four-game stretch in which Rhodes had the game winner in every game, spanning from Aug. 31 to Sept. 16. She scored twice on the road at Maryland and played a part in 16 of the Badgers’ 33 goals on the season. Three Badgers were named to the Midwest All-Region team. Sophomores Victoria Pickett and Dani Rhodes were both named to the first team, while freshman Sammy Kleedtke earned a spot on the third team. UW has had three or more players on All-Region teams in two of the last three seasons. Kelsey Jenkins left her mark on the program, becoming UW’s first and only three-time first-team All-Big Ten pick in program history. She finished the season leading the conference in batting average and onbase percentage and as the program's career runs leader. The Badgers clinched their second-consecutive NCAA berth and made the tournament for the fourth time in six years. Four of the Badgers’ six all-time NCAA tournament appearances have come under head coach Yvette Healy. UW knocked off its highest-ranked opponent in school history, upsetting No. 6 Auburn, 3-2, at the prestigious Mary Nutter Classic and handed the Tigers their first loss of the season. The future is bright for the Badgers as both Haley Hestekin and Taylor Johnson were named to the All-Big Ten freshmen team. Widely considered to be one the nation’s top up-and-coming coaches, Yuri Suguiyama was named the 10th head coach in the history of the UW men’s swimming and diving program on April 17, 2018. As an assistant coach, Suguiyama helped the Cal men score top-two NCAA finishes in each of his six seasons in Berkeley. Senior Victor Goicoechea swam a time of 14:48.36 in his final race as a Badger, competing in the 1650-yard freestyle at the NCAA championships. The time ranks second all-time at UW, trailing only former teammate and Olympian Matt Hutchins (14:31.19). Goicoechea ranked among the Big Ten’s top five swimmers in both the 1650 and the 500 freestyle (4:16.21) for the season. He matched his seasonal standing in each event by placing fourth in the 1650 and fifth in the 500 at the Big Ten championships. The Badgers were boosted by newcomers Tyler Zelen — who posted the second-fastest 50 freestyle time in school history, at 19.59 — and Big Ten Freshman of the Week honoree Matt Novinski. Beata Nelson shattered the Big Ten’s 100 backstroke record with a swim of 49.78 seconds on her way to winning the conference title. She then swept the backstroke crowns with a record time of 1:49.27 in the 200. Nelson is one of just four women to break the 50-second barrier in the 100 backstroke — and is the only woman to do so three times. She owns the third- (49.78), fifth- (49.83) and seventh-fastest (49.92) times in history. Only Stanford’s Ally Howe (49.69 and 49.70) has gone faster in the 100 back. In finishing second in the 100 back, third in the 200 back and sixth in the 200 individual medley, Nelson became the second Badger to earn three individual first-team All-America citations at a single NCAA championships — joining Ellen Stonebraker (1999). The foursome of Beata Nelson, Marissa Berg, Ari Saghafi and Abby Jagdfeld smashed a school record with their swim of 3:30.96 in the 400 medley relay at the NCAA championships. Wisconsin tallied 14 wins on the season, posting a winning record for the third time in three seasons under head coach Danny Westerman. UW is now 46-29 under Westerman. Seniors Chema Carranza and Josef Dodridge tallied a record of 30-4 together, boasting UW’s highest doubles win total since 2010. The duo also reached No. 2 in the ITA rankings, the highest ranking in school history. Carranza and Dodridge were selected for the 2018 NCAA Championships and recorded just the fourth NCAA championship doubles win in school history and UW’s first since 1988. Sophomore Daniel Soyfer earned first-team All-Big Ten honors after leading Wisconsin in wins with a record of 24-12. Carranza and Dodridge became the first Wisconsin duo to win the ITA Midwest Fall Regional, winning nine consecutive matches overall to advance to the semifinals of the National Championships. Wisconsin opened the season with six consecutive wins, recording the program's best start to a season in over 25 years. The Badgers posted a .537 cumulative win percentage in singles play this season, going 115-99 overall. That’s a dramatic improvement from last season's .360 win percentage (71-126). Freshman Lexi Keberle became UW’s first freshman to earn first-team All-Big Ten honors since 1996. The Badgers have now had a first-team all-conference selection in four of the last five years. Keberle led Wisconsin in singles wins with a record of 25-10, going 13-5 at the No. 1 position. The freshman also made her debut in the ITA national rankings, climbing as high as No. 98. Oliver Hoare became the first Badger to earn an NCAA 1500 meter title since Don Gehrmann won a trio of titles from 1948-50. Hoare took down NCAA record-holder Josh Kerr (New Mexico) in the nail-biter race with a time of 3 minutes, 44.77 seconds. Hoare ran the sixth-fastest time in school history in the 1500 meters at the Bryan Clay Invitational with a time of 3:37.84. That time led the Big Ten Conference throughout the season and also ranks No. 4 by a Badger during the collegiate season. Junior Trent Nytes enjoyed a wildly successful season as a multi-event athlete for the Badgers, including a Big Ten heptathlon title and making appearances at the NCAA Indoor and Outdoor Championships. Most notably, Nytes recorded a personal best score of 7,683 points in the decathlon at the Bryan Clay Invitational, a score that ranks No. 7 in program history. The distance medley relay squad of Joe Hardy, Eric Brown, Corbin Ellis, and Oliver Hoare smashed the school record in the event with a time of 9 minutes, 27.72 seconds at the Alex Wilson Invitational. Their time qualified them for the NCAA Indoor Championships, where they earned First-Team All-America honors thanks to a sixth-place finish. Georgia Ellenwood became the first Badger in school history to win a national championship title in the heptathlon. The senior clinched the win thanks to a score of 6,146 points, earning her eighth All-America accolade. Ellenwood also earned her first Big Ten title in the heptathlon with a score of 6,173 points. That score broke the Big Ten Conference record and earned the senior the No. 1 seed going into the NCAA Outdoor Championships. Senior Taylor Amann won her third Big Ten pole vault title with a clearance of 14 feet, 3 1/2 inches, matching the school record in the event. Amann became the first Badger to sweep the indoor and outdoor pole vault conference titles. Sophomore Alicia Monson became just the fifth Badger to break the 15:40 mark in the 5K. Monson ran a personal-best time of 15 minutes, 38.32 seconds at the NCAA West Preliminary Championships to qualify for the NCAA Outdoor Championships, where she earned Second Team All-America honors. The Wisconsin women’s 4x100 relay team of Meagan Blair, Gabby DesRosiers, Brenna Detra and Ebony McClendon qualified for the NCAA Outdoor Championships, where they earned Second Team All-America honors thanks to their time of 44.48. That time marks a new school record, and also marks the fourth time that the squad broke the record throughout the season. The Badgers advanced to their fifth-straight NCAA regional, marking the first time in program history that UW has competed in five straight regionals. Rettke was the first Badger freshman to earn first-team All-America honors by the AVCA. Junior Tionna Williams and freshman Sydney Hilley earned honorable mention accolades. The trio were also named AVCA All-Northeast Region while Rettke and Williams were All-Big Ten honorees. Hilley and Rettke were named to the Big Ten All-Freshman team. Wisconsin ranked 10th nationally in hitting percentage, recording a school-record .299 percent for the season. That broke the old mark of .289 set in 2001. Rettke set the individual season record for hitting percentage with .443. Wisconsin played the sixth-toughest schedule in the nation and the toughest schedule in the Big Ten this season, according to the final NCAA strength of schedule. Head coach Kelly Sheffield picked up career win No. 400 as Wisconsin defeated Maryland on Oct. 18. He is 408-147 (.735) in 17 years overall as a head coach and 135-35 (.794) in five years at UW. Two Badgers hit 1,000 career kills during the 2017 season. Senior Kelli Bates became the 21st UW player to record 1,000 kills against Ohio State on Nov. 3. Senior Lauryn Gillis earned her 1,000th career kill at Indiana on Nov. 10. Wisconsin sent seven of 10 starters to the NCAA championships. It marked the 11th time in the last 13 seasons that the Badgers have qualified five or more wrestlers. Freshman Evan Wick started his career with a bang, ending with a 30-7 record on the season and went 6-3 in Big Ten duals. He earned the 112th All-America honor in school history with a third-place finish at 165 pounds. Wick led all UW wrestlers with 30 wins, 102 takedowns, 15 four-point nearfalls, six tech falls, seven major decisions, an 11-match win streak and the quickest pin (.33). Wisconsin had three wrestlers become U-23 All-Americans at the World Team Trials. Evan Wick took second place at 74 KG, Hunter Ritter took second place at 92 KG and Jens Lantz took seventh place at 61 KG. UW has had at least one wrestler earn All-America in each of the last 14 seasons. Chris Bono became the 16th head coach in Wisconsin wrestling history. Bono spent the last six seasons as the head coach at South Dakota State, coaching three conference champions in the program’s three years in the Big 12. Bono leaves SDSU with a 6441 overall record, a total of 24 NCAA qualifiers, five All-Americans and one national champion. Coach Bono stacked his staff, adding two national champions as the new assistant coaches to lead the program to new heights. Jon Reader was named associate head coach and Matt McDonough was named assistant coach. One member of each varsity sports team on every campus is chosen by their institution as a Sportsmanship Award honoree, and two Outstanding Sportsmanship Award winners are then selected from each institution. Sportsmanship Award winners distinguish themselves through sportsmanship, ethical behavior, good academic standing and must have demonstrated good citizenship outside of the sports-competition setting. Presented annually at each Big Ten institution to a male and female student-athlete in the graduating class who has demonstrated proficiency in scholarship and athletics. The Medal of Honor is the most prestigious award in the conference, being awarded to only 28 student-athletes annually since its start in 1915. The Remington Scholars are seniors who graduate with the highest cumulative grade point average in their class. Named in honor of former UW professor Frank Remington, who was a faculty athletics representative to the NCAA, Big Ten and WCHA, recipients receive a $1,000 scholarship providing they enter a post-graduate program within one year of graduation. Presented by the U.S. Track and Field and Cross Country Coaches Association, a student-athlete must have compiled a cumulative GPA of 3.25 and have met at least one of the following athletic standards: For cross country, a student-athlete must finish in the top-25 (or 10 percent) at regionals or as an All-American in the national meet. For the indoor season, a student-athlete must have finished the regular season ranked in the national top 96 in an individual event or ranked in the national top 48 (collective listing) in a relay event on the official NCAA POP list provided by TFRRS.org. For the outdoor season, a student-athlete must have participated in any round of the NCAA Division I Championships (including preliminary rounds). Chi Alpha Sigma is a nonprofit organization established to recognize college studentathletes who earn a varsity letter in at least one sport while maintaining a 3.4 or higher cumulative GPA throughout their junior and senior years. The governing board represents all levels of competition in the National Collegiate Athletic Association (NCAA) and the National Association of Intercollegiate Athletics (NAIA). Big Ten Distinguished Scholar/ WCHA Scholar Athlete The Big Ten Distinguished Scholar was begun in 2008-09 and honors student-athletes who have an annual grade point average of 3.70 or above. The WCHA Scholar Athlete was begun 2005-06 and honors student-athletes who have a yearly or cumulative grade-point average of 3.50 or above.